Sciblogs | When is an experiment a 'bungled' experiment? When is an experiment a 'bungled' experiment? I wasn’t in the sharpest frame of mind on Saturday morning after a big night on the town in Auckland with some journalist friends the previous night. However I couldn’t help but notice the headline screaming out from the front page of the New Zealand Herald frontpage as I passed an inner-city dairy. Hangover forgotten, I promptly bought a copy of the Herald and devoured the front page story, which indeed was a good scoop for environment reporter Eloise Gibson, who received some interesting material from the Ministry of Agriculture and Forestry under the Official Information Act about genetic modification experiments Agresearch is carrying out. These transgenic experiments have already received a lot of public attention and involve putting human genetic material into cow cells to produce calves that have some human genetic traits. The scientists hoped that the genetic code, a human follicle stimulating hormone (FSH), would enable the cows that were produced to produce milk containing compounds that could be used as a human fertility treatment. Under permits issued by the Environmental Risk Management Authority last month, AgResearch can put human genes into goats, sheep and cows for 20 years to see if the animals produce human proteins in their milk. The proteins could eventually be used to treat human disorders. Those couple of paragraphs sum up well the aims of the research. They come after an explanation of how three calves involved in a “bungled experiment” at Agresearch’s Ruakura facility died after developing abnormally large ovaries. The details are unpleasant – no one likes to hear about animals suffering and dying and the story will no doubt infuriate campaigners against animal testing. But what about the experiment was “bungled” or as One News put it on Saturday night, “botched”? The Herald story goes on to reveal that the calves reared by Agresearch were, in the opinion of a MAF investigator “better cared for by vets at Ruakura than they would be on a standard dairy farm”. The state of the calves was reported to Agresearch’s animal ethics committee which told the company to monitor the calves. Agresearch was open with MAF about the problems the calves had developed. Agriculture Minister David Carter even got involved on hearing of the death of the calves and asked for information but was “satisfied with AgResearch’s response”. So we have a case of cows dying in the course of genetic modification research, a result which scientists probably didn’t predict and were a bit puzzled by. But isn’t that the whole idea of an experiment? To test in a contained environment the effect of something that hasn’t been tried before. Isn’t that how numerous pharmaceuticals, foodstuffs and healthcare treatments have been tested in preparation for human consumption? How many lab rats, mice, dogs and pigs have died in the testing of the shampoo we use, the drugs we take, the food and drink we consume? Were those deaths the result of bungled experiments? Possibly. But animals die in the course of animal testing. As Jim Suttie points out in the Herald article – such an occurrence is not a “big deal” and in fact is a foreseen outcome of some experiments. It sounds callous, but on the cutting edge of science, the whole idea is to find out what can and will go wrong in animals so it doesn’t go wrong in us. There’s a valid story in the fact that calves died in the course of a GM experiment. It indeed raises again the vexed issue of animal testing and what society’s tolerance is for experimenting on animals. Last month we saw both perspectives in this debate when animal testing opponents picketed the NZBIO conference in Auckland while inside, John Forman of the New Zealand Organisation for Rare Disorders argued passionately for more animal testing to help tackle debilitating treat human disorders. But just because animals die in an experiment doesn’t mean that experiment was botched by the scientists involved. In fact, I haven’t seen anything in news reports to suggest the experiment was handled inappropriately or unprofessionally. So did this story really deserve its front page lead status and unique green headline screaming “GM” in 72 point bold? I’d have to agree with you there, Peter. Something I am continually upset by is the focus on animal experimentation in medicine and GM (for which there are clear, widespread benefits), but few or no mainstream focus on the use of animal experimentation in cosmetics (for which there is, arguably, no such need). There is a movement, which was started in the UK, called Pro-Test (http://www.pro-test.org.uk/). They support animal experimentation in scientific research, regulation and animal welfare. They do a lot of work trying to explain the unfortunate necessity of animal testing in drug and biological research, also on clarifying how experimental animals are treated at universities and hospitals. 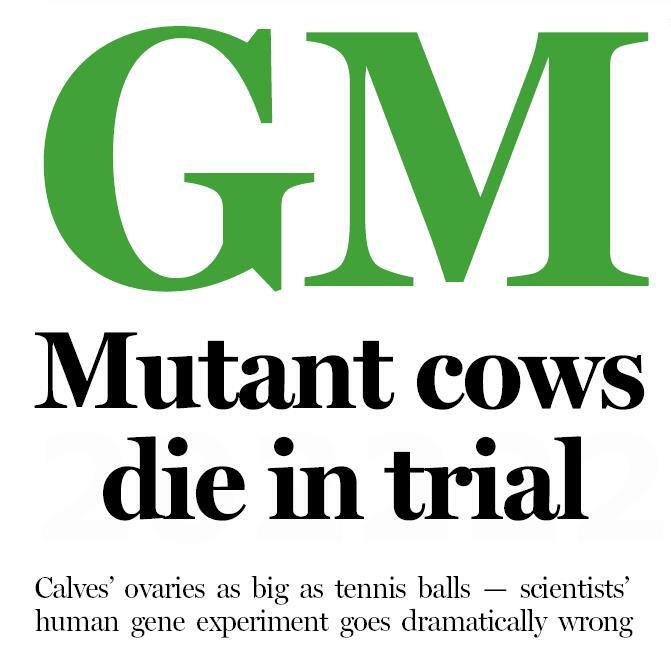 I dunno, GM cows modified with human genes in order that they produce fertility treatments, dying as a result of the experiment? That’s wrong on so many levels that if you are apologising for it, or calling it “not a big deal”, you’ve completely lost your moral compass. Never mind the 72 pt bold, this should be illegal. This is plainly the pursuit of evil in the service of greed. At least Dr Frankenstein built his monster out of intellectual curiosity. To my eye, what was bungled here was the release of information. If I were managing a research program such as this, I’d release material via some public channel as soon as it came within domain of the Official Information Act. Making people jump through unnecessary hoops to get information gives the impression of having something to hide. From watching the news it seemed that one out of four calves survived and that the deaths didn’t involve prolonged suffering, which seems to me to be a not-bad survival rate for a brand-new procedure. I’m inclined to agree, Peter. To me, a ‘bungled’ or ‘botched’ experiment would be one where the methodology was suspect from the start, or was set up to confirm a priori assumptions. Neither is good science. But in this case the experiment seems to have been properly designed & what we are seeing is, as you say, a completely unexpected outcome. If the scientists concerned had known that the animals would develop lethally oversized ovaries & went ahead anyway, then yes, rainman, you could say they’d lost their moral compass. But they didn’t do that. Science throws up unexpected outcomes all the time; that’s how it works. In this case the outcome happened early (& just 4 animals were involved). Now the researchers will be looking at what went wrong & how to avoid it. We might indeed have grounds for complaint if things had reached the production stage before the problem was discovered, & animals were dying in rather larger numbers. If the scientists concerned had known that the animals would develop lethally oversized ovaries & went ahead anyway, then yes, rainman, you could say theyâ€™d lost their moral compass. But they didnâ€™t do that. Science throws up unexpected outcomes all the time; thatâ€™s how it works. Perhaps where we differ is with regard to the consequences. To my mind, if the scientists concerned knew there could be such significant risks to the animals, they should not have proceeded – certainly not in the interests of building a fertility treatment, doubtless for ultimate commercial gain. And if the science is not yet well enough developed to make an accurate risk assessment, more work is required before live animals are used. This is just plain old animal abuse – and should be illegal. It’s certainly unethical (actually quite repulsive) in my book. Your assertion that it’s OK because few animals were involved is preposterous – should I be able to do similar experiments on just a few humans? I do know how science works. Oddly though, when I assert that the unexpected outcomes you refer to are a good reason not to do (plant) GM outside of a very stringently contained lab, I’m ridiculed. Read this while up at Auckland. The lead-in material twists the story into a beat-up, particularly that word ‘bungled’. Have to ask where the editor’s balance of judgement is on this IMHO. +1 to Alison’s remarks. One reason trials are small-scale initially is to try catch major issues sooner rather than later. Actually, Rainman, from my interpretation of Alison’s comments you both have similar views. My impression was that the oversized ovaries was a completely unexpected result that couldn’t have been anticipated. Risk assessments are useful but one can’t always anticipate all possible outcomes. Unanticipated results crop up in science everyday. In my own field (organic synthesis) it is often the unexpected results that open up new possibilities. Although in the case of the cow experiment I think the unfortunate results have indicated a rethink of the project is required. Actually, Rainman, from my interpretation of Alisonâ€™s comments you both have similar views. My impression was that the oversized ovaries was a completely unexpected result that couldnâ€™t have been anticipated. Then I fear you have completely misunderstood me. – Alison was saying the scientists did not know this would happen, so that’s OK then. – I am saying if they knew it could happen, the ethical thing to do would have been to not do the experiment. Risk assessments are useful but one canâ€™t always anticipate all possible outcomes. Indeed, one would hope so. But given our propensity to view animals as “just things” that we can dominate and experiment on, I am not holding my breath. First up, I don’t think ‘they’re just cows so that’s OK’. Maybe I didn’t express that too well, though. But if we never tried things out because they ‘could’ go wrong, I don’t think science would have progressed very far at all. That particular result – I don’t see how it could have been anticipated; what they seem to have got was a completely unexpected impact on the development of the calves’ ovaries.